Stop wasting journey time when travelling for business with our mobile office solution! Travelling for business can’t always be avoided, but all that time out of the office doesn’t have to mean time wasted on your busy schedule. 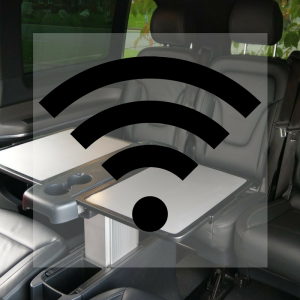 Our luxury vehicles offer you the perfect mobile office environment, complete with wifi, soundproofing, privacy glass and adjustable seating in the back of our Chrysler and Mercedes with “swivel ‘n go” chairs so face to face meetings can take place on route. It goes without saying that our professional drivers work with the utmost discretion and any conversations taking place within the vehicle remain private. If you need to book corporate transport for either yourself, a colleague or boss, please don’t hesitate to get in touch.